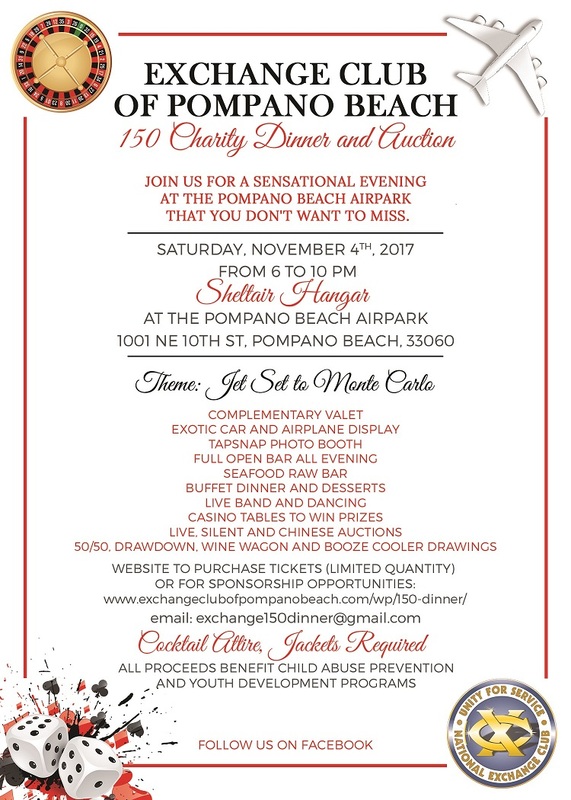 On Saturday, November 3rd from 6-10PM at the Sheltair Hangar of the Pompano Beach Airpark, the Exchange Club of Pompano Beach will hold its 62nd Annual 150 Charity Dinner and Drawdown. Last year’s dinner, “Jetset to Monte Carlo,” was such a fun and successful event that they are hosting it at the same venue but with a new theme of “A Night at the Races.” It will be a Derby Party with betting on old horse races to win prizes. There will be a premium open bar all night, buffet dinner, live band, dancing, TapSnap photo booth and contests for best hats and outfits. Fundraising activities including handicapped horse races to bet on, 50/50 raffle, wine wagon, 150 draw-down, and live, silent and Chinese auctions. One hundred percent of the proceeds will go towards local charities and community organizations such as: The Children’s Healing Institute, the Broward Children’s Center, the Boys and Girls Club, First Tee of Broward, Our Father’s House Soup Kitchen, Woodhouse, Dynamos, the DAV, Honor Flight and many more, along with providing student scholarships. Last year’s event netted over $35,000 and we would like to increase it this year to $45,000 by building off the great feedback we received from attendees as this being one of the most fun and unique social fundraisers ever in the area. The event is capped at 300 people and it sold out last year. Tickets can be purchased online only for $150 at www.bidpal.net/nightattheraces No tickets will be sold at the door, so please purchase them early. Dress is Derby attire required. Sponsorship opportunities are also available and the Exchange Club is accepting donations for their auctions to help promote your business. The Exchange Club is a 501(c)3 non-profit service organization, which focuses on child abuse prevention, community service, student recognition and scholarships, and Americanism and Veteran’s support. Contact Joel Rask at 954-663-7751 or Donn Atkins at donn.atkins@gmail.com for more information. I am the committee chair for the Exchange Club of Pompano Beach’s 150 Charity Dinner and Auction. This year we are holding our signature event at a Sheltair jet hangar at the Pompano Beach Airpark. Our theme is “Jet Set to Monte Carlo” and we have limited the event to 300 tickets for this cocktail attire evening. We will have valet parking by Sheehan Cadillac, exotic cars from Progressive Motors and a private jet on display, TapSnap photo booth, casino tables to play at to win prizes, a seafood raw bar, full open bar all evening, buffet dinner, and the CK Band for entertainment and dancing. Pompano Beach Mayor Lamar Fisher will be our auctioneer and we will also have silent auctions and raffles. In addition, there is a draw-down for a chance to win $5,000! 100% of the funds raised supports local charities such as The Childrens Healing Institute, Broward Children’s Center, The Boys and Girls Club, Woodhouse, the Dynamos, the Crockett Foundation, First Tee of Broward, Our Fathers House, Honor Flight, the DAV, Freedom Fighters Outdoors, the Sample-McDougal House and many more. If you are interested in attending or sponsoring this event, tickets and sponsorship opportunities may be purchased online at www.exchangeclubofpompanobeach.com/wp/150-dinner. Please feel free to contact me if you have any questions. Thank you for your time and support in helping make our community a better place! We will be holding our annual candy buyback from October 30th through November 2nd from 8am to 4pm. We will pay children (and adults) $1 per pound of candy and then we will donate it to Operation Gratitude, who sends the candy to our military members overseas. Last year we collected over 300 pounds, lets see if we can beat it this year! For more information, contact the office at 954-782-1864. I am the committee chair for the Exchange Club of Pompano Beach’s 150 Charity Dinner and Auction. 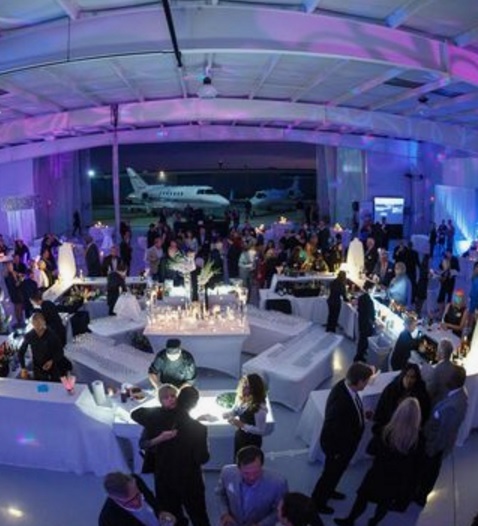 This year we are holding our signature event at a Sheltair jet hangar at the Pompano Beach Airpark. Our theme is “Jet Set to Monte Carlo” and we have limited the event to 300 tickets for this cocktail attire evening. We will have valet parking, exotic cars and a private jet on display, TapSnap photo booth, casino tables to play at to win prizes, a seafood raw bar, full open bar all evening, buffet dinner, and the CK Band for entertainment and dancing. Mayor Lamar Fisher will be our auctioneer and we will also have silent auctions and raffles. 100% of the funds raised supports local charities such as The Childrens Healing Institute, Broward Children’s Center, The Boys and Girls Club, Woodhouse, the Dynamos, The Crockett Foundation, Our Fathers House, Honor Flight, the DAV, the Sample-McDougal House and many more. The Exchange Club is a 501(c)3 service organization that focuses on child abuse prevention, community service, student recognition and scholarships and Americanism. Tickets and sponsorships for the event may be purchased online at www.exchangeclubofpompanobeach.com/wp/150-dinner. I had the amazing opportunity to volunteer as a Guardian for a WWII Veteran with South Florida Honor Flight to Washington DC. We flew out of Ft. Lauderdale with 78 other veterans and their guardians to take them on “One last mission” to see the WWII and Korean War Memorials, Arlington National Cemetery and the Iwo Jima Memorial. It was an awesome day to learn so much from these veterans and hear of the experiences they had and the sacrifices they made. The world would not be what it is today without these brave men and women…truly the greatest generation! When we returned to Ft. Lauderdale airport, there were a couple thousand people on hand to give the veterans a welcome home that they had never gotten after WWII. It was such an honor to be a part of this flight and I am so grateful to have gotten to know my Navy veteran, Chris Nielsen. From November 2nd through the 11th, you can sell your unwanted or leftover Halloween candy to our dental office for $2 per pound. Your candy will then be donated to Operation Gratitude and sent in care packages to US troops who are overseas. We will also be giving out hygiene goody bags to kids who sell back their candy. Our goal is to raise 50 pounds of candy to donate. It is a great way for your kids to earn a little extra cash and hopefully prevent them from getting cavities! We are also still holding our diaper drive for the Junior League of Boca Raton Diaper Bank for the next two weeks, and if you bring in a box of diapers, you have a chance to win a free Zoom one hour teeth whitening. Thanks for your participation in our community efforts! How would you like to get your teeth whitened for free? Well, from now until October 29th, we will be holding a diaper drive for the Junior League of Boca Raton’s Diaper Bank. If you bring in a package or box of diapers, you will be entered into a drawing to win a free Zoom! One Hour Teeth Whitening procedure ($500 value). The average infant or toddler needs 50 to 80 diaper changes per week and access to a reliable supply of diapers for these children’s parents and caretakers is necessary for their health. In Florida, 24% of children live in poverty and diapers cannot be bought with WIC or food stamps. Therefore, these parents must find another way to obtain diapers, especially in order to send their children to daycare while they work. That is where the JLBR diaper bank comes in, as they are the only one in Broward and Palm Beach Counties, by distributing over 50,000 diapers a month. Our goal is 1,000 diapers and with your help, we can contribute to keeping their warehouse stocked! On Sunday, August 2nd, our office participated in the 8th Annual NFL Alumni Caring for Kids Charity Bowling Tournament at Sawgrass Lanes. This event helped raise money for the Broward Children’s Center, the Children’s Healing Institute and the Exchange Club of Pompano Beach. The event raised approximately $20k! Our own treatment coordinator, Joy, was the top female bowler and won a football autographed by all the players in attendance! On wednesday, April 29th at Whole Foods in Pompano Beach, the Exchange Club of Pompano Beach will be the receiving 5% of the total sales for the day from this location. These funds will all go towards child abuse prevention in South Florida, one of the Exchange Club’s main goals. April is child abuse prevention month and the Echange Club and Children’s Healing Institiue will be raising awareness about their organizations and how they are working to end child abuse in South Florida. Please come out to Whole Foods Pompano tomorrow and shop to support this great cause. Thank you to Whole Foods for giving back to the community! To learn more about the Children’s Healing Institute go to www.childrenshealinginstitute.org or the Pompano Beach Exchange Club at www.exchangeclubofpompanobeach.com.